You'll be £19.99 closer to your next £10.00 credit when you purchase Unconditional Surrender. What's this? Walter Ludde-Neurath was an accomplished officer, who served with a variety of torpedo boats and destroyers, slowly rising through the ranks. In September 1944 he was selected to be the new adjutant to Grand Admiral Donitz. He enjoyed a close relationship with Donitz over what proved to be a crucial period: the formation and dissolution of the Flensburg Government (named after the headquarters Donitz was using at the time of the appointment). 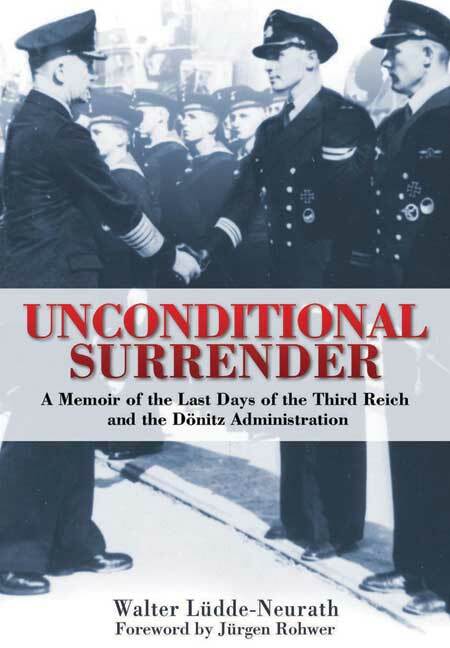 The memoir details the discussions within the new cabinet, which was created after Hitler's suicide, and records how Donitz believed he would rule a new Germany and reach an accommodation with the Allies. Ludde-Neurath details the fighting amongst the candidates - in particular, the confrontation of Donitz with Himmler (for which Donitz kept a revolver within his reach). Ludde-Neurath was present when the British Royal Hussars carried out Operation Blackout, surrounding and arresting the fledgling government and records how Donitz was asked if he had any comment. Donitz responded: 'Any words would be superfluous' and was taken into custody. This is one of the most valuable accounts we have of the last government of the Third Reich, and the events that unfolded as the Allies closed in on Germany. This publication gives an excellent account of these final days and given the fact that the author was "relieved" of many of the original primary papers he has done a splendid job in describing the events. It is seriously recommended to those interested in the Third Reich. Walter Ludde-Neurath served as adjutant to Karl Donitz, the commander of chief of the German navy, and charged by Hitler to be the head of state upon his death. Jürgen Rohwer is a German naval military historian and professor of history at the University of Stuttgart. Rohwer has written more than 400 books and essays on naval history and military intelligence.